The Government's Help to Buy Scheme was first launched in April 2013. The scheme aims to help borrowers secure a 95% loan-to-value (LTV) mortgage on a new-build property. The Government provides an equity loan, also known as a second-charge loan, of up to 20% of the property's value to eligible borrowers, who then need at least a 5% deposit to secure a mortgage through participating lenders. The main benefit of this scheme is that it allows borrowers to take on mortgages at 75% LTV, which have better terms and are more readily available than 95% LTV mortgages. Use our mortgage search page to see for yourself what rates you can get on a 75% LTV mortgage compared to a first-time buyer mortgage at 95% LTV. You must be a resident in England. However, similar schemes are available in Scotland, Wales and Northern Ireland. The scheme is not available to assist buy-to-let investors or those who will own any property other than their Help to Buy property after completing their purchase. For the first five years you won't have to pay anything on the 20% equity loan that the Government provides. However, this doesn't mean you'll be paying nothing in the first five years. Remember, throughout this time you will be expected to be repaying the first-charge mortgage. After five years, the equity loan will be subject to a fee of 1.75% per year on the outstanding amount of the equity loan. From the fifth anniversary of the loan, this fee will rise each year in line with any increase in Retail Prices Index inflation (RPI) plus 1%. You will be contacted before the fees start to set up monthly payments with your bank. You'll also be sent a statement about your loan each year. The equity loan that the Government provides on a Help to Buy property is known as a second-charge mortgage. When you sell your Help to Buy home (unless you have chosen to repay your equity loan earlier), you will be required to pay back the Government's equity loan. 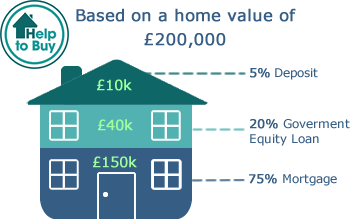 For example, if the Government provided a 20% equity loan on your Help to Buy property, then when you sell the house you will pay the Government 20% of what the home sells for. Remember, once you have purchased your Help to Buy property you can choose to make voluntary part repayments or a full repayment of the equity loan at prevailing market value. This means that when you come to sell your property you won't owe the Government anything. If you want to buy a home through the Help to Buy equity loan scheme, then you must either contact a Help to Buy agent in the area you want to live in or contact a participating house builder. To find an agent in your local area visit the Government website. The current version of the Help to Buy scheme is due to expire in March 2021, so you will need to apply before that time. The Government has announced that a replacement scheme will run for two years after that date. The new scheme will be subject to different property price caps depending on which area of England the property is located in. Compare Help to Buy ISAs to help you save towards your house purchase.